Stock # C56330, 6.4L OHV V8 Turbo-Diesel Power Stroke Engine, Automatic, 124388 mi. 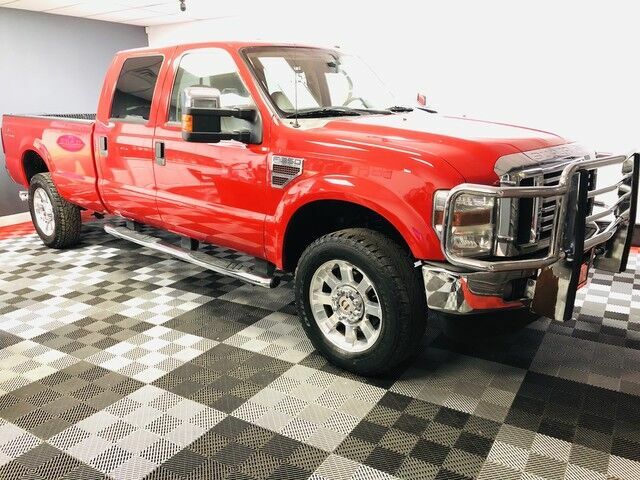 Auto Source of Texas is honored to present a wonderful example of pure vehicle design... this 2008 Ford Super Duty F-350 SRW Lariat only has 123,724mi on it and could potentially be the vehicle of your dreams! This Ford includes: ADJUSTABLE GAS Adjustable Pedals DUAL 160-AMP ALTERNATORS (4) UPFITTER SWITCHES 4X4 OFF ROAD PKG 6.4L OHV V8 TURBO-DIESEL POWER STROKE ENGINE Diesel Fuel 8 Cylinder Engine Turbocharged TOWCOMMAND SYSTEM Integrated Turn Signal Mirrors Power Mirror(s) Heated Mirrors Power Folding Mirrors CHROME PKG Tow Hooks Running Boards/Side Steps PWR SLIDING REAR WINDOW Sliding Rear Window SIRIUS SATELLITE RADIO Satellite Radio DRIVERS MEMORY PKG Mirror Memory Power Driver Seat Adjustable Pedals CAMEL, LEATHER LUXURY CAPTAIN CHAIRS W/CONSOLE Leather Seats Bucket Seats HEAVY SERVICE SUSPENSION PKG RED HEATED DRIVER Heated Front Seat(s) STABILIZER PKG CAMPER PKG REVERSE CAMERA SYSTEM Back-Up Camera CHROME TUBULAR CAB STEPS Running Boards/Side Steps TORQSHIFT 5-SPEED AUTOMATIC TRANSMISSION W/OD 5-Speed A/T Transmission Overdrive Switch A/T ELECTRIC SHIFT-ON-THE-FLY TRANSFER CASE TRACTION CONTROL Traction Control REVERSE VEHICLE AID SENSOR Rear Parking Aid TAILGATE STEP AUDIOPHILE AM/FM STEREO W/IN-DASH 6-DISC CD CHANGER CD Player AM/FM Stereo CD Changer Premium Sound System Auxiliary Audio Input *Note - For third party subscriptions or services, please contact the dealer for more information. * When you purchase a vehicle with the CARFAX Buyback Guarantee, you're getting what you paid for. The CARFAX report for this 2008 Ford Super Duty F-350 SRW Lariat highlights that it's a One-Owner vehicle, and for good reason. A One-Owner vehicle gives you the feel of owning a new vehicle without paying the new car price. Want to brave the road less traveled? You'll have the 4WD capabilities to do it with this vehicle. Low, low mileage coupled with an exacting maintenance program make this vehicle a rare find. Added comfort with contemporary style is the leather interior to heighten the quality and craftsmanship for the Ford Super Duty F-350 SRW This highly refined Ford Super Duty F-350 SRW comes with exciting features you'd expect in a vehicle twice the price. If not for a few miles on the odometer you would be hard-pressed to know this 2008 Ford Super Duty F-350 SRW is a pre-owned vehicle. More information about the 2008 Ford Super Duty F-350 SRW: The 2008 Ford F-250 (three-quarter-ton) and F-350 Super Duty (one-ton) pickups are intended for those who regularly need to tow large trailers or haul heavy loads. When properly equipped, the F-350 can pull up to 19,200 pounds. These Super Duty trucks also have several features not otherwise offered in their class, such as the rearview camera system, and PowerScope mirrors that fold in and telescope. This model sets itself apart with toughness, wide range of configurations, Towing and hauling capability, and standout convenience features.